Soak the soy meat pieces in bean paste, soy sauce, and about 1 ½ tbsp of water for at least 20 minutes. Heat oil in the pan. First add fermented soybeans, and cook for 1 minute. 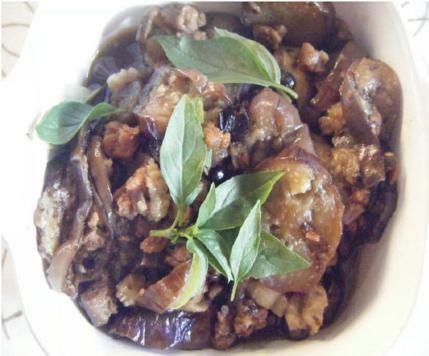 Gradually, add the eggplant slices and cook for 4 to 5 minutes. Add the seasoned soy meat to eggplants and cook for another 3 minutes. If it gets dry, add 1 tbsp of oil or water. Cover and simmer for another 4 to 5 minutes. Sprinkle Thai basil leaves just before serving. If you like, you may sprinkle some sesame oil.